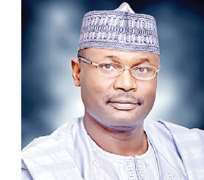 The Independent National Electoral Commission (INEC) has decided that voting will hold simultaneously with accreditation of voters during the 2019 general elections. National Commissioner and Chairman, Information and Voter Education Unit, of the commission, Mr. Festus Okoye, disclosed on Wednesday in Abuja. The commissioner was speaking at a workshop for journalists on the 2019 election organised by the American Embassy in Abuja. In a paper titled “The Media and Reporting of Election Results'', said only voters with verified Permanent Voter Cards (PVCs) would be allowed to vote. He said, , “For the 2019 general elections, the voting procedure shall be in accordance with the Continuous Accreditation and Voting System (CAVS) and only voters with PVCs verified by the Smart Card Reader (SCR) shall be allowed to vote. “The accreditation process shall comprise verification by SCR, checking of the register of voters, and inking of the cuticle of the specified finger,'' he said. “Others are accredited observers and any other who in his opinion has lawful reason to be admitted,' he said. The workshop, which was attended by representatives of various media organisations was also held at the American Space in Ibadan, Bauchi, Kano and Cababar simultaneously. Resource persons at the event included Mr Gary Kebbel, a Professor of Journalism at the University of Nebraska Lincoln, Aliyu Mustapha, Managing Editor, Voice of America and Mr Musikilu Mojeed, Chairman, Board of Premium Times Centre for Investigative Journalism.